It’s an age ­old argument. 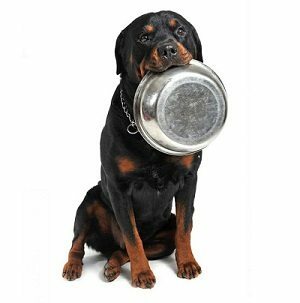 Should you feed your Rottweiler canned or dry food? Many of us have our own opinions on why we only feed our dogs canned, or why we only feed our dogs dry food. Your decision could be based on your past pet experience, what your friends feed their dog, what your breeder feeds their dogs, or what your veterinarian suggests. I wanted to get to the bottom of this argument and find out what the pros and cons are for each choice. Canned food is a great choice for certain dogs. It all depends on your dog. Canned food is a great choice for a dog that does not drink a lot of water. This type of food is a good source of extra hydration. If your Rottweiler has health conditions, canned food can be a great option for them. Consider your dog’s health situation. Is your dog getting older? Canned food is great to feed an older dog. It is generally rich in scent, and when your dog gets older, sometimes their sense of smell is less than it was in their prime. This can make food not quite as appetising to them, so the richer the smell of the food, the more appealing it will become to them. Using the same point of argument, canned is a great choice for dogs who have vision problems, which could be due to age, or another medical condition. If your dog is having trouble seeing, they will be able to find their food by using their noses much easier with canned food. Not only is canned food richer in scent, it is also richer in flavor. This makes canned food quite appealing to your Rottweiler. So if your Rottie is ill and is not eating, try giving them canned food. The rich smell and taste can entice them to eat it. Canned food is also soft. 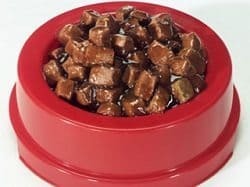 If you have an older dog, this can be a great way to get them to eat more if they have been lacking an appetite. Canned food is great for dogs with missing or no teeth, poorly aligned jaws, or smaller mouths. There are some cons to buying canned dog food for your Rottweiler. The main one simply being that it does not have a long shelf life. The problem with feeding your dog canned food is that it spoils really fast. When you open a can, and do not use the whole thing, you will have to make sure you store it properly and use the rest of it very quickly. Once opened, it is best to use it immediately. It can be dangerous to feed your dog canned food that has not been stored properly. If you feed your dog spoiled dog food, you are certainly not doing them any favors. They could definitely get sick. Always remember to keep unused portions of canned food covered and in your refrigerator, and use it within the next 72 hours at least. Canned food can be very messy. You may find that your dog gets it all over the floor when they are eating it and you spend more time cleaning their eating area than you would like to due to this unfortunate fact. Also, if your dog does not finish eating all the food you put out for them, it is going to attract insects. Canned food is best if eaten all at once since it does not keep well. If your dog already has predispositioned dental problems, they will need more attentive dental care. Canned food is not great for your dogs teeth, but when your dog’s teeth are bad and they develop dental problems, you will have no choice but to feed them this type of food, because it may be too difficult for them to eat harder food. Canned food seems to be far less economic to purchase. It is not cheap. Of course this all depends on the quality of canned food in which you are feeding your Rottweiler. It is suggested to feed your dog the highest quality canned food that is in your price range. This makes canned food a bit more expensive. Dry food is definitely the more convenient choice of dog foods for your Rottweiler. 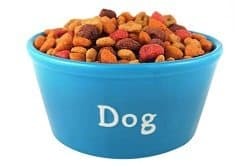 You can fill your dog’s bowl up and leave it out for them to eat at their leisure without fear of spoilage. The shelf life for dry dog food is much longer than that of canned food. Dry food can be kept out without having to worry about being refrigerated or stored any special way. You can just toss it in your closet and forget about it. It is suggested to keep it in a plastic container to keep it fresh, keep insects out, and keep hungry dogs out. If you happen to have more than one dog, it’s more economical to feed them dry food. It is easily stored, and costs much less. You can purchase much more of it at once and easily store it in a plastic container. The larger bag you purchase, the less expensive it is. Where as with canned food, you are purchasing can after can, and don’t generally get great deals on multiple can purchases. At least not quite like you would with dry food. Dry food can also be used for training. You can use pieces of dry kibble as rewards for your dog during your training sessions. There is no need to buy expensive treats for your dog for training purposes, just grab some dry kibble and you are good to go. For your dog’s dental health, it is suggested to feed them dry food. There are even special types of dry food that are particularly good for their teeth. They have dry foods that are specially formulated and shaped to aid in cleaning your dog’s teeth as they chew. The one thing dry food does not offer your dog is moisture. As your dog ages, it becomes more important to make sure they are kept hydrated. This is also important if your dog is sick. If you live in a hot or dry climate, it is also important to make sure your dog gets enough water into their systems. Dry food does not help introduce water into their diets, so it is even more important to make sure they always have enough water to drink. Both choices are perfectly fine to feed your Rottweiler. It just depends on your dog’s needs and your personal lifestyle. 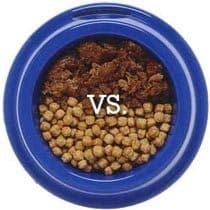 They are both healthy for your dog, but one may fit your dog’s needs more than the other, so the decision is ultimately yours to make. Another option for you would be to mix the dry and canned food together. This way they get the best of both worlds. It is also great if you just wanted to give your dog canned food as an occasional treat and feed them dry food regularly. This will greatly cut down on the cost of food, but the decision is completely up to you and your dog. What works for me may not work for you, so you will need to figure out what works best for your personal situation. You can always contact your veterinarian for suggestions on which direction you should go in for your particular pet.